What Are These White Things on Face? Waking up one morning and discovering white things on face can be quite frightening. Fortunately, these tiny spots that look like white seeds under skin are often easily explained. They might not look great, and you can get rid of them as soon as possible. But sometimes, the white things on face return. What can you do about it? What looks like white seeds under skin can be distressing, but they are actually quite common. Here’s what you are actually seeing when you look at those white things on face. When oil builds up on you face, whiteheads might develop. Hard oil in pores can lead to clear or white bumps right under the skin. 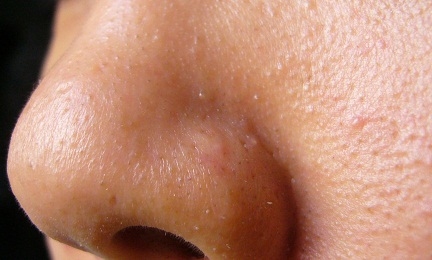 These clogged pores might appear on your chin or hairline, but they often appear in the “T spot” – across your forehead, down your nose and all the way to your chin. Causes: Hard oil in pores builds up and causes a blockage, which then turns into a hard spot. This might happen due to hormonal changes, such as during pregnancy or puberty. It might also happen simply due to genetics, which means if your parents had a great deal of acne, you might have it too. Treatments: To get rid of whiteheads, exfoliate your skin on a regular basis. This will open up the pores and allow the white seeds on face to dissipate. A good pore cleanser, used every day, will help keep whiteheads to a minimum. These are hard, raised bumps. They are like a tiny ball under the skin, and you might even be able to “move” them somewhat. They are usually on the cheeks and around the eyes, and often occur on babies. Causes: Babies have these naturally, but they tend to go away quickly after birth. For adults, it might be caused by genetics, smoking or using makeup or oils, such as mineral oil. Treatments: These tiny white things on face do not respond to acne medications. A good dermatologist is needed to see. They will work to gently extract the spots. Don’t try to do this by yourself, as you are likely to end up with serious scarring. Once they are removed, it is important to exfoliate regularly to prevent their return. 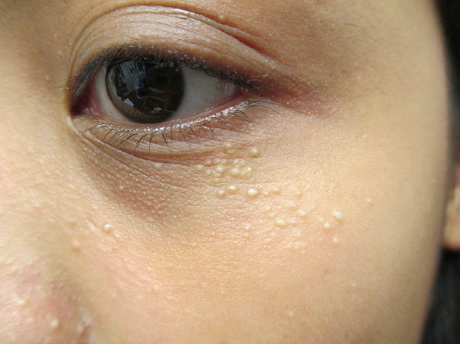 Also known as sebaceous cysts, these white things on face are small lumps underneath the skin. They are round, with white or yellow in the center, and look like pimples. They are found on the face, neck and torso. Causes: Most of the time, your skin rejuvenates by sloughing off dead skin cells. But in the case of these cysts, the cells actually move deeper into the skin instead of sliding off when you clean your body. The result is a cyst that has keratin in the center. Keratin is a white or yellow substance that might drain out from the cyst. Treatments: If the cyst is in an inconspicuous place and doesn’t cause any pain, you can leave it alone. But if you need treatment, see a dermatologist. They might use injections to reduce the swelling of the cyst, incise and drain the cyst to open it up and release the keratin, or perform minor surgery. In fact, surgery is the best way to remove these cysts and prevent them from coming back. Server responsed at: 04/20/2019 10:52 p.m.